VinGrate Mat is a multi-purpose pool and wet area matting for sports and leisure use where non-skid barefoot traffic mat is required, great in both indoor and outdoor applications. This mat provides you with safety, maximum hygiene, slip-resistance, 4-way drainage, supreme durability, UV resistant and comfort on barefoot. VinGrate mat is made of strong non-porous 100% PVC vinyl material and features one piece welded open grid construction with special channeled underbars for self-draining. The embossed raised surface keeps feet warm and dry over the hot concrete outdoors and with its unique design provides a level finish look over uneven surfaces. As well, protects your feet from the surfaces heated by the direct sunlight and it is very comfortable to walk on. This mat can accumulate the large amount of water and is highly effective with its multi-directional instant water drainage system. Therefore, it is not only perfect to consume a splash, but also for making a splash of colors around your swimming pools, changing facilities, shower/locker-rooms, spas, saunas and jacuzzis (hot-tubs) or any other wet areas you can think of using our one or more of VinGrate mat's eye-catching colors. Also, easy to cut and trim on site for boat and deck matting. Mats will not curl, tear or dry out during weather changes all seasons long. The mat comes in 3 and 4 feet widths up to 33 feet long rolls. From there it can be cut down to any size you want. 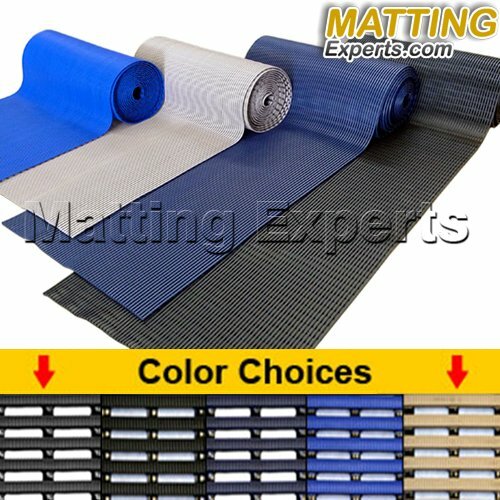 VinGrate matting is the excellent choice high quality drainage mat for keeping wet areas dry in your facilities whether it is interior or exterior use. Technical: Available up to 4 feet wide and 33 feet long. Please contact us for pricing and any additional information. ALL MATS ARE CUT TO ORDER THEREFORE ARE NON-RETURNABLE ! ACTUAL MAT SIZES MAY VARY BY UP TO 1 INCH ! Open backing construction for easy draining. Allows water to drain through the mat or debris to be trapped below surface level. 3/8" Thick (9.5 millimeter) Embossed slip-resistant surface design mat. Very comfortable to walk on. Ideal for variety of wet areas such as swimming pool and aisles, shower/locker-room, sauna, SPA, deck, wave simulators or any humid area. Available up to 4 feet wide and 33 feet long. Please contact us for pricing and any additional information. If you have any questions about this product by MattingExperts, contact us by completing and submitting the form below. If you are looking for a specif part number, please include it with your message.